Apprising Ministries has long been a leading critic of the sinfully ecumenical neo-liberal cult operating within the Emergent Church aka the Emerging Church with its more clearly delineated postmodern Progressive Christian theology. It’s actually a Liberalism 2.0 that these rebels against the authority of God’s Word often refer to as “big tent” Emergence Christianity; in other words, this is the Love Wins mythology of former EC rock star pastor Rob Bell. Now to be sure, we’re not the least bit surprised that Living Spiritual Teacher and Quaker mystic Richard Foster would recommend the warped work of apostate Dr. Tony Jones, heretical “theologian in residence” at the social gathering (not a church in the Biblical sense) of his equally heretical friend and “pastor,” universalist Doug Pagitt. I mean, not when at least two state conventions in the Southern Baptist Convention quite specifically recommend both guru Foster and wannabe guru Jones as you’ll see clearly documented in Alabama Baptist Convention (SBC) Encourages You To Learn Lectio Divina From Apostate Tony Jones. Nah, really comes as no surprise at all. Answer: If you pick up Richard Foster’s “Celebration of Discipline” and his other work via Renovare, you’ll get a great exposure to the Christian mystical tradition. “The Spiritual Formation Workbook” is a great resource too. Tony Jones’ “The Sacred Way” is also a sturdy introduction to contemplative practices. 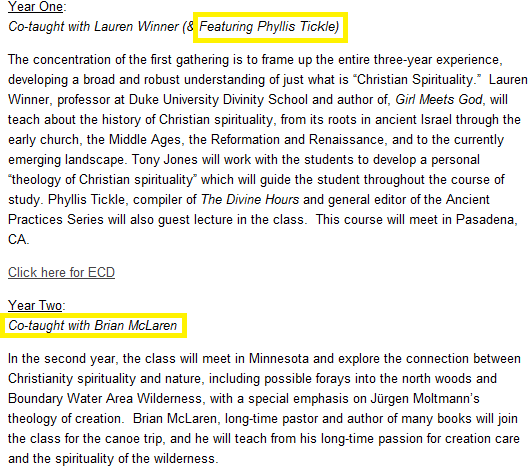 It’s clear that EC guru Brian McLaren considers Richard Foster and Tony Jones as leading authorities on CSM; as does FTS, since they have professor Jones teaching a doctorate level course in Christian Spirituality. I’ve long been critical of Jones’ theology; but I’ve never said that he doesn’t know his apostasy well. I’ve always thought Jones is very knowledgable about the CSM of Foster-Willardism. Without a doubt Richard Foster is the living Golden Buddha of this corrupt Counter Reformation spirituality, which flowered in Rome’s antibiblical monastic traditions. It then produced apostate Roman Catholicism and would later lead the Church of Rome to anathematize the very Gospel of Jesus Christ itself. 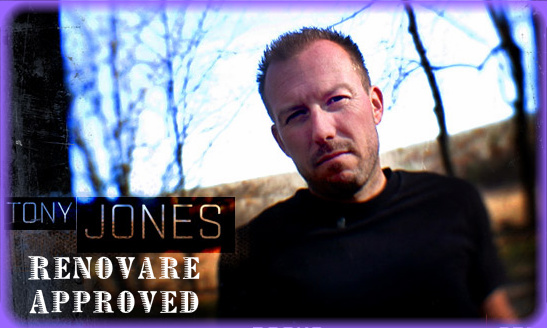 Well, we also know that Foster believes Tony Jones to be an authority concerning CSM as well. In closing this, for now, remember Jesus tells us to carefully examine the fruit (cf. Matthew 7:15-18), i.e. the teachings and life of, those who would dare to claim to teachers of God’s Word (cf. James 3:1). So, in the case of FTS professor Dr. Tony Jones, we need to keep in mind his own practice of CSM. It’s a critical factor in his doctrine as his views concerning Christian spirituality stem from this neo-Gnosticism. The social gathering of Pagitt, where Jones guides their theology, has now even put that sinful mythology into practice as you’ll see in Doug Pagitt And His Solomon’s Porch Affirm Homosexual Sin. And now FTS professor Tony Jones is so far gone out into spiritual outer space that he’s making the case in favor of multiple sexual partners, which I showed you in Tony Jones Argues For Open Marriage And Polyamory. A professor at an ostensibly evangelical seminary arguing against proper Christian sexual ethics; such is the sorry state of the spiritually spineless evanjellyfish community. If this is what CSM has produced in the life of Dr. Tony Jones, then why would we want to practice it? And if CSM guru Richard Foster’s discernment is this far off that he’d promote someone who’s not a Christian brother, why listen to him?